The reverb is one of the first effects that were used in music and a must in the arsenal of any guitarist. And today we bring you some of the best reverb pedals on the market. We have chosen a good variety in different price ranges so that everyone can include this effect on their pedals. In addition, at the end of the purchase guide, we will give you some useful tips so you know how to get the most out of the pedals. 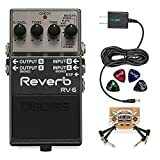 What to keep in mind when buying a reverb pedal? What is important to you in a reverb pedal? We are going to give you some basic tips to buy your new pedal without going crazy. Budget: Be clear about your budget before you start comparing pedals. If you start comparing 50 € pedals with 300 € pedals, you will lose your mind. Your needs: Surely you have a rough idea of the sound you want to achieve. Therefore, do not look for it to have a hundred thousand effects, only what you need to create that sound. Construction: If your budget allows, look for pedals with metal casings. Think of it as an investment and most last for years or even a lifetime! True Bypass: This function makes the pedal not alter the signal while it is off. 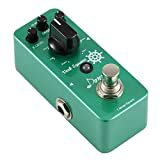 This is very important in the reverb pedals since it is very rare that they are connected all the time, and without the true bypass they can distort the signal of the guitar. TonePrint: Although this capability is typical of the TC Electronic brand, its operation is so versatile that it is difficult to consider buying other models of pedals. Brands that your idols use: Investigate the pedals that your idols use and look for the pedal brands that give them that sound that has you in love. It goes without saying that reverb is one of the most important and prevalent effects in the audio world. There are probably very few recordings out there that don’t have at least a touch of reverb applied. Reverb is basically the sound that “lingers in the air” after it happens, due to the sound waves reflecting off of surfaces. The more reflections happen and the larger the space you’re in, the more dramatic the effect. Picture being in a cathedral and letting out a yell. Your voice will reverberate quite a bit and it will sound like your yell is extended, and the volume will eventually taper off into silence. The same thing happens when you sing in the shower, though the reverb “tail” might not be as long as in a huge cathedral. Conversely, imagine you’re in a small sound deadening booth with foam walls. If you let out a yell, the sound waves will be absorbed by the foam and thus won’t reflect back to your ears, so there will not be a reverb effect. Hall Reverb: As the name suggests, this type of reverb emulates a concert hall, generally offering reverb that lasts between 1 and 3 seconds. Typically, hall verbs start with plenty of audible early reflections, followed by a full reverb body and then a tail that rolls off on the high end. For this reason, hall verbs are often quite warm. Chamber Reverb: Chamber reverb gives a short decay time, resulting in a little more clarity. Typically, chamber reverbs last between 0.4 and 1.2 seconds, and are also quite warm in sound. Room Reverb: Room verb normally lasts between 0.2 to 1 seconds. Room reverbs are often quick acting, with lots of early reflections, and end with a quick decay and little frequency roll off. Plate Reverb: When we’re talking about digital reverbs, this is an emulation of an analog reverb in which sound vibrations were sent through a plate of metal that itself vibrated, resulting in reflections of the sound. Plate reverbs are often very full sounding and have a very “smooth” sound. They sound great on lead vocals, but also on guitar in situations where the reverb does not need to take too much attention away from the listener. 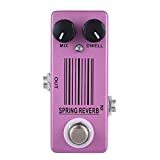 Spring Reverb: As mentioned before this is an analog reverb, emulated in digital verbs, that has a fairly sharp sound compared to other reverbs, with it seeming like there is a roll off of bass frequencies. Bottom Line: Without question, Space and the Strymon BigSky are the two pedals with the most capability. You can lock yourself away in your studio and not emerge for weeks just playing with reverb options (It’s a great time in history to be a guitarist). And yes, these two are the most expensive options on this list by quite a margin. However, we feel compelled to add that while they are definitely premium products, the price per the options available to customize the sound isn’t bad at all. You get unparalleled options in a small footprint. Ultimately, it all comes down to your budget and playing style. If your reverb is switched on non-stop and you’re experimenting with custom shoegaze sounds, we wholeheartedly endorse getting something like Space. If on the other hand, you use reverb sparingly, we’d opt for the still versatile but budget-friendly options like the Hall of Fame 2 or Boss that come in at less than half the price. To make this guide, we assembled Equipboard’s expert group of guitarists to help us research and test. For the first few days, we looked at what our favorite artists were using, combed through popular guitar forums, and read industry reports to make a tally of what reverb pedals are mentioned and given positive endorsements. We then took the top 10 from that list and purchased them. Then came the fun part; we tested each of them in our studio over several days, and at the end decided which are worthy of the top spots, taking into consideration value for the money. The type of reverb pedal that’s the best for you will be different to what’s the best for other people. Keep this in mind when somebody claims that X is the best reverb pedal or if you see a ‘Top 10 Reverb Pedals’ list somewhere online. This is the same advice I give in my Delay Pedals Buyer’s Guide – the best pedal is the one that fits your individual needs as a guitarist. This buyer’s guide will help you work out what type of reverb pedal will be the best for you. I will explain what options there are, what features to consider and whether a pedal may or may not suit you. By the end, you will know exactly how to find the right reverb pedal for you. There are so many reverb pedals available today that it can be overwhelming trying to find the one right for you. There are quite a few different types of reverb effects available and each gives a very different sound. Some reverb pedals even mix in different effects on the one pedal such as delay or modulation. Have a think about what you want your reverb pedal to do. Do you want it to be simple so you can just leave it on and forget about it? Or do you need a lot of flexibility so you can get the perfect reverb for different songs? Do you want to have different types of reverb such as spring, plate or hall or are you looking for one unique sounding reverb to give your tone something fresh compared to other guitarists? Everybody will answer these questions differently which means everybody will have a different ‘best reverb pedal’. 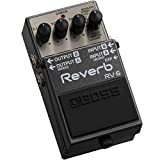 Value: how much do you want to spend on a reverb pedal? Simplicity: do you want an easy-to-use pedal or are you happy to deal with a more complex pedal to get more out of it? Flexibility: are you looking to achieve one main reverb sound or do you need to be able to tweak and switch between different reverb types? Presets: do you like the idea of saving different presets or are you happy to need to manually adjust the pedal to change to different settings? Quality: do you want the best quality pedal, regardless of cost or are you happy with a good quality pedal at a great price? Size: does the size of the pedal matter to you? How much pedalboard space do you have available for a reverb pedal? Think about the above points before you continue so you know what’s important to you in a reverb pedal. Let’s go through the most common reverb pedal features so you can decide which ones are important to you. Not all features will be relevant to you and no pedal will have every feature covered here. So think about which features are the most important to you and which ones you don’t need. Just like delay, there are quite a few different types of reverb – especially when they’re mixed with effects. The main types of reverb worth thinking about are Hall, Plate, Room & Spring. The spring reverb is where a long metal spring vibrates and a pickup captures that vibration. It has a very distinctive sound and if you shake the spring reverb device you can usually hear the metal spring shaking. Some amps (especially vintage amps) have built-in spring reverbs while today it’s usually emulated digitally (it’s not very practical to have a real spring reverb pedal in most pedalboards!). Plate reverb is similar to spring reverb with the main difference in that it uses a sheet of metal instead of a spring. The sheet vibrates from a transducer and a pickup captures that vibration. Hall & room reverbs emulate what you naturally hear in large empty rooms or halls. 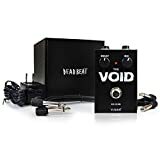 Most pedals that offer room or hall reverb allow you to control the size of the room to achieve anything from a small subtle effect all the way to a massive church-like reverb. 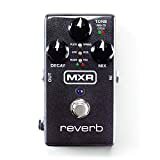 MXR M300 Reverb – excellent quality pedal with a nice range of reverb types. You can read my review of the M300 here. Boss FRV-1 63 Fender Reverb Pedal – a popular pedal designed to reproduce a vintage reverb so many guitarists with Fender amps are accustomed to. Wampler Faux Spring Reverb Pedal – Wampler produce great quality gear and while the features may be a bit bare, it’s a pedal many guitarists rave over. EarthQuaker devises Afterneath V2 – if you’re looking for a unique pedal that produces effects a standard reverb pedal won’t produce, the Afterneath is worth checking out. As I mentioned at the start of this guide, there are countless reverb pedals out there. It’s very easy to get lost in all the features and brands so sticking to the pedals listed here will help you save a lot of headaches. Think about what features are most important to you then check out the pedals I recommend above.